MY GROWING PASSION: Saltmarsh: regeneration of an endangered habitat. Saltmarsh: regeneration of an endangered habitat. Lane Cove National Park is a narrow, irregularly-shaped ecological reserve surrounded by Sydney suburbs. It is marked in dark green in the map below. Although it extends over 10 kilometres in length, it is only 6 sq kilometres in area. It surrounds the Lane Cover River, which begins in Hornsby to the north and opens into Sydney Harbour. Its location, topography and perimeter present major ecological impacts on the park, specifically storm-water run-off from residences and weed invasion. A key feature of natural Sydney vegetation is that it is largely adapted to soils derived from ancient sandstone, notoriously low in nutrients--particularly phosphorus. While seeds of invasive plant species evolved in high nutrient environments are likely found in all urban Sydney bushland, they generally cannot develop to maturity where nutrient levels are poor. Where run-off occurs, however, nutrients from human activity fertilise the soil and weeds can thrive. That's why weeds are more likely to be found near suburban bushland creeks than in the bush beyond. In addition, cuttings and seeds from weeds can be washed into the area, to propagate and invade. Weeds can then out-compete native plant species and destroy habitat and food sources of native fauna. Sugarloaf Point is a region in the park that was once a thriving saltmarsh ecosystem. In 1940, 1.2 ha of the Point (below) were mangrove swamp, and 0.2 ha were saltmarsh. Sugarloaf Point in 1940. Image © NSW Dept of Lands 2011. Midway through last century, the river was dredged to improve boat access, and the excavated silt deposited onto the salt marshes. Sugarloaf Point in the 1969s, at the height of dredging operations. Photo courtesy of National Parks and Wildlife. Over time, bushland has regenerated on the former saltmarsh site. Casuarinas now growing on the site where the dredged silt was dumped. Saltmarsh ecosystems provide a crucial role in coastal estuarine systems. They provide habitat for a range of molluscs and crustaceans, and act as nurseries for species that find their way into harbours. Microbats feast nocturnally on the high insect populations they support. And marshes recycle nutrients to make them available to other species. These environments are filled with water at high tide, and completely washed out during king tides. At king tides, fish enter to feed on the abundant prey available there. Sarconornia quinqueflora is a key species in Australian coastal saltmarsh. In New South Wales, coastal saltmarsh is listed as an endangered ecological community under the Threatened Species Conservation Act 1995. Frequently associated with this saltmarsh in saline wetlands are mangrove swamps, which provide habitat to a range of endangered and threatened species of flora and fauna, including the critically endangered Beach Stone-Curlew, Esacus neglectus. Mangrove swamp, Lane Cove National Park. Given the vulnerability to disturbance and pollution in Lane Cove National Park, one might imagine that its saltmarshes don't have a hope in Hades. However, thanks to the work of the National Parks and Wildlife Service, its local ranger, Andrew Duffy, and groups like Friends of Lane Cove National Park, extraordinary saltmarsh restoration is taking place there. Saltmarsh restoration at Lane Cove NP. Creating physical conditions is only part of the story. There's also chemistry. The environment needs to be kept free of the pollution that encourages weeds. To this end, nutrient traps have been created to decrease harm from storm water from adjacent residential areas. Below is a gross pollutant trap, which collects leaf litter and rubbish. The content from the trap is removed and disposed of off-site. More particulate pollutants need a finer trap, so crushed sandstone storm-water treatment traps have been set up, immediately adjacent to the nearby major road. immediately adjacent to Pittwater Road. The crushed sandstone is obtained from construction sites in the Sydney area, and makes an ideal medium to suppress weeds and provide suitable substrate for native plants. It is placed on terraces constructed across the embankment. Beneath the trap is a settlement pond, where escaped nutrients settle and are physically removed with an excavator when around five tonnes of sediment have accumulated. Thanks to Dr Michelle Leishman of Macquarie University's Department of Biological Sciences and to NPWS Ranger, Andrew Duffy, for introducing me to his magnificent habitat and restoration work. If I were a rich woman (ya ha didle deedle, didle deedle didle deedle dum) I'd donate to this cause in a heartbeat. Very interesting and great news for beautiful Lane Cove National Park! When I first moved to Sydney in the late 1970s, the Harbour and all its rivers were so polluted and dank smelling, and the mangroves had been pulled up or cut down to improve 'views' everywhere. It's great to see the hard work of volunter groups as well as Parks' staffers has led to such improvement in a relatively short time. I'm also interested in the crushed sandstone in one of the pics ~ are the native plants planted directly into it, or is it a form of 'mulch'. Yes, I was thrilled to see it too. Like you, I remember Sydney's rivers being horribly stinky. So stinky, no one wanted to live on them, but now, they're some of the most sought-after property. It's really wonderful to witness the transformation, although so much more needs to be done. I remember reading a while ago about the islands in Sydney Harbour, in the first 100 years of the colony. One of them was home to an abattoir, and the bits that weren't used were just thrown into the water. If the prevailing wind was towards you.... Eeep. My understanding, regarding the crushed sandstone, is that it acts as both mulch and soil. A sufficient layer of it will stop weeds from germinating/sprouting, and the tubestock is planted directly into it. Frankly, it makes me tempted to get a load for my weed-ridden front garden, but I think I'd better just use the old elbow-grease (as my mum would say). Just imagine, Felix, living in a world where funding restoration work like that was a priority! Hi Margaret, Great Blog, I am with Friends of Lane Cove National Park and we got the grant that is suporting the work in the Sugar Loaf / Kittys Creek area you looked at. We have another area upstream, close to the old Fairyland area, it includes some Salt Marsh, Fresh Water Wetland and another endangered community, so very interesting. Once again Friends of LCNP have managed to get a grant for work in the area. We are now trying to get a vounteer group together to work maybe 3 hours one Sunday a month to carry onn looking after the area when the grant finishes. If you or any of the othgers on the course are interested let me know. You can look at Friends of LCNP WEB site for more info. Hi Margaret, Great Blog, it is an interesting area. 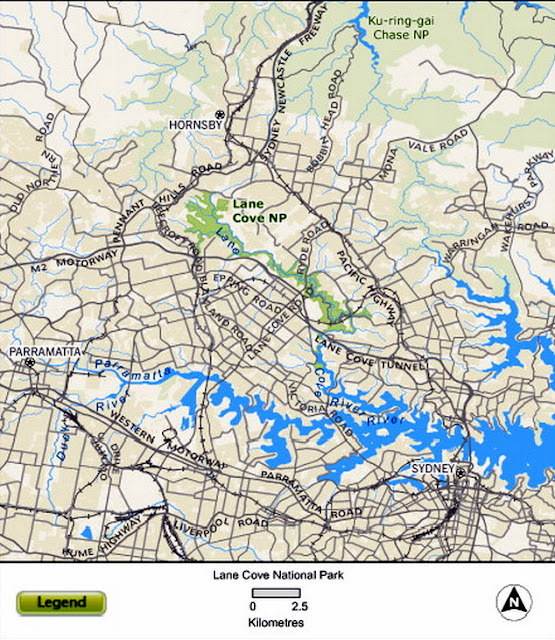 I am with Friends of Lane Cove National Park, we got the grant that is currently funding the work there. We have anther site further up stream near the old Fairyland area that might be of interest to you. It includeds some salt marsh and two more Endangered Ecolgical Communities. We also have a grant to fund some work there, but need to start a volunteer group tp carry on with the site when the grant runs out. Plan to meet for about 3 hours one Sunday / month. If you or others are interested let me know, or look on the Friends of LCNP web site. Hi Tony. Great to hear from you, and congratulations on the amazing work you're doing! I'll pass your message onto people who might be interested in getting involved.